Gecoding is the process of assigning coordinates (geographical latitude and longitude) to postal addresses. This activity is the first step to depict information and data on maps. 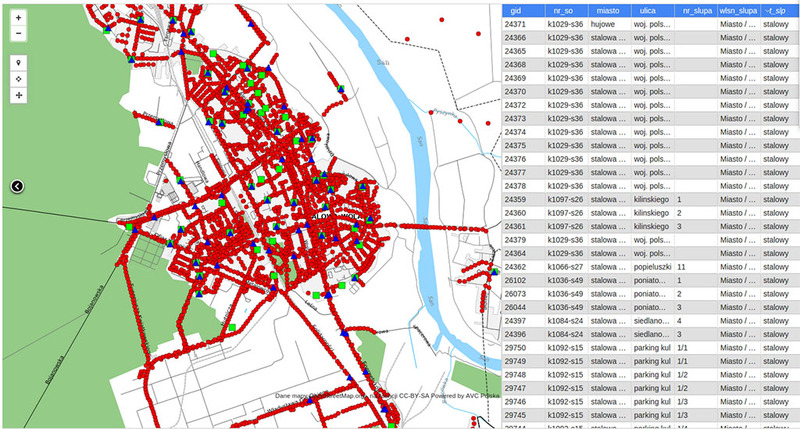 In the process of geocoding we base on proven algorithms and a multimillion base of postal addresses in Poland. We can also cope with incomplete addresses (e.g. spelling mistakes, no postcode or just a postcode). We create dedicated GIS solutions in the form of web applications for individuals and companies having greater needs regarding management of spatial data, their visualisation and reporting. The GIS software allows the creation of any set of analyses and reports and the map, creation of own layers and their management, and work via a desktop application or a website. The service has the greatest range of options of changing background maps, automatic geocoding or presentation of data on the map. GIS services are highly tailored to user’s needs, both when concerning matching the application with the requirements and adjustment of the model for settlement of the project (licence fee or software as a service). Our solutions are not only browsers, but also the entire systems for input, storing and verification of data and their exchange with other systems. Our systems automatically report changes, make summaries and statements.